A candy, a drink from the ’80s, a balm for pain are a few select examples of Indian FMCG prowess. Stunning growth: The FMCG sector in India is expected to more than double to $104 billion by 2020 from the current $49 billion. The sector is expected to grow at a compounded annual growth rate (CAGR) of 20.6 per cent. There is almost nothing else in the world growing this quick. New Delhi/Mumbai/Chennai: Certain brands leave such a deep impression on minds of consumers that they have become synonymous with a service or a product. Google’s search, for example, has become a verb while Xerox — a company that makes photocopying machines — is synonymous with any kind of copying. But such phenomenal success is not the exclusive preserve of foreign companies. India has several companies that overshadowed multinationals in their respective fields, even becoming household names. Hence, Nirma, the go-to detergent powder of the 1980s and Amrutanjan for pain relief. And then, there’s Rasna — the drink that was a must in every home in the ’80s. These FMCG products became household names because of quality and word-of-mouth publicity. Many of these companies became the subject of lectures across business schools and essential learning for entrepreneurs who want to carve a niche for themselves in the fast growing FMCG segment — currently dominated by cash-rich multinational companies. Their continuing prosperity has been largely linked to India’s growing economy. Any increase in the earning power of individuals instantly boosts FMCG sales as consumers naturally seek better-quality products. 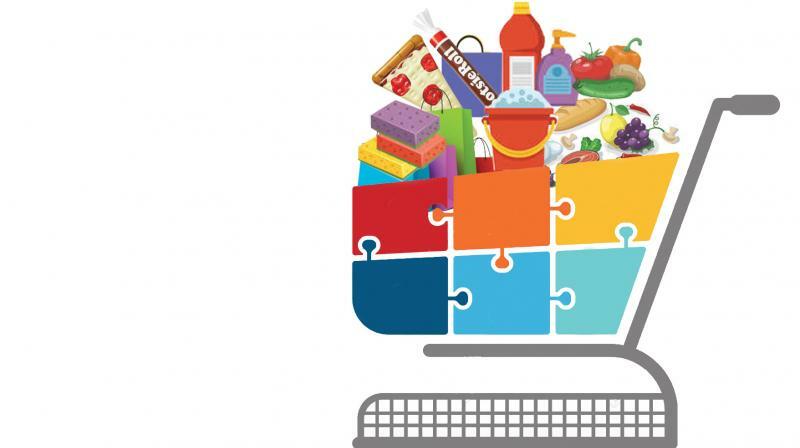 According to an extensive research report by Assocham-TechSci, India’s FMCG market is expected to more than double to $104 billion by 2020 from the current $49 billion. The sector is expected to grow at a compounded annual growth rate of 20.6 per cent. There is almost nothing else in the world growing this quick. Food products form the leading segment, accounting for 43 per cent of the overall market, followed by personal care (22 per cent) and fabric care (12 per cent). These three segments are expected to see intense competition from the global majors so it is extremely important for Indian companies to devise out-of-the-box ideas to fight the strengthening invasion. The taste of money: A bright green raw mango candy began making waves two years ago. The product, launched in 2015, with a liquid aam panna centre, overwhelmed competition and in just eight months of its launch, it became a Rs 100-crore brand. Now, two years after its launch, Pulse candy is worth over `300 crore. It’s made by the DS Group, manufacturers of the Rajnigandha pan masala. “We discovered that the confectionary sector was rather stagnant, despite having a vertical growth potential. We also found that kachcha aam or raw mango was the most favoured flavour, capturing a 26 per cent market share while other mango flavours had 30 per cent share,” said DS Group VP (new products) Shashank Surana. This revelation made them think out of the box — to package a tangy mango candy. “We saw mango was a favourite taste in India. But the common practice was to eat raw mango with something tangy. That’s how we got the idea of a powder-filled candy,” Shashank Surana says. And why name it ‘Pulse’? “Because it sets your pulse racing,” came the glib answer. It took two years to produce Pulse. Within a month of launch, demand was so high shops started selling the Re 1 candy for an additional 50 paise and after a year, there was a supply crunch. In January, 2016, the DS Group started scaling up production and so far, the one-rupee candy has clocked Rs 300 crore in sales, beating MNC blue-chip brands such as Oreo and even home-grown Parle. The company now plans a foray into Canada, the UK, and the UAE. A big fight is being won: Even as every local soft drink brand crumbles under MNC pressure, Rasna fights on. The multinationals had captured the ready-to-consume soft-drink market, which had grown due to changing consumer preferences and rising number of refrigerators. Rasna, unfazed, simply expanded the soft drink concentrate market by going global. The brand added more products — jams, fruit cordials, teas, pickles, chutneys and ready-to-eat curries. Currently, Rasna is sold in 53 countries. Sales in the Gulf and the South-east Asian neighbourhood account for the larger chunk of export and Latin America is next. “Some Latin American countries have large, state-sponsored initiatives for children. They provide drinks as nutritional supplements to school kids at subsidised rates or free of cost. We are in talks with a few governments to be part of these programmes,” says Piruz Khambatta, chairman and MD. Africa is an emerging market too for Rasna but it finds the market there to be value-conscious. So it sells sachets that are low on sugar and price in western Africa. In markets such as the US and Europe, Rasna sells ethnic flavours. “We are role models for Indian firms that want to fight multi-nationals and continue growing. We are one of the very few that are truly made in India,” Khambatta adds. Rasna was among the domestic soft-drink brands that came up in the mid ’70s after Coco-Cola withdrew following foreign exchange regulations. In the ’80s, the drink concentrate was a major category in the soft drink market and Rasna enjoyed over 90 per cent market share. But the category has not grown as fast as the soft-drink market. The soft drinks market grew from Rs 13 crore in 1982 to Rs 14,000 crore in 2014. At around Rs 700 to 800 crore, soft drink concentrate is just two per cent of the market now. But while the soft-drink concentrate market did not grow as expected, Rasna continued dominance. All attempts by MNCs to dislodge it from its spot have failed. The Baba and his big breakthrough brand: By no measure, is Patanjali a small Ayurveda brand. It’s a home-grown, full-fledged desi FMCG behemoth. And the man behind the success is a rustic yogi, not a B-school educated number-crunching master tactician. In just 10 years, Patanjali has grown to challenging the likes of Unilever, Colgate, P&G, Dabur and Godrej, across categories. In doing so, it has created its own rules and re-written others — especially around branding and distribution. In fact, after Patanjali, Hindustan Unilever, India’s largest consumer goods company, was compelled to launch a raft of Ayurvedic personal care products. Reports claim Patanjali crossed Rs 5,000 crore in 2016. And now, Baba Ramdev wants to go global. He is already exporting — targeting Indians in the UK, US, Canada and Mauritius. Patanjali has even received offers of distribution from businessmen and retailers in the UAE, Iran and Azerbaijan. LIJJAT papad: What makes Lijjat Papad’s journey so unique is not just its rags-to-riches tale. It was truly, built by India. “It was a movement of women, by women and for women,” says Swati R. Paradkar, president of the Shri Mahila Griha Udyog Lijjat Papad. It started in 1959 when seven women from a densely-populated area of South Mumbai called Girgaum gathered on the roof of a building to make four packets of papads. The group started with a borrowed capital of `80 and now, nearly six decades later, Lijjat papad is the combined effort of 45,000 women “members” across 82 branches, generating an annual turnover of Rs 1,600 crore. These members are joint co-owners of the institution, which is governed by a central managing committee comprising 21 members drawn from its ranks. “We are growing at 8-10 per cent per annum. We have plans to increase number of branches to 100 and scale up our strength to 50,000,” Paradkar adds. The organisation, which is recognised by Khadi the Village Industries Commission as a village industry, retains just less than two per cent of its net profit for future business needs. Remaining cash is distributed amongst members. When asked about the company’s success formula, Paradkar says, “All our members are from the grassroots and know local requirements. That is how we diversified into other products such as traditional masala, appalam and detergents.” The company now exports its products to UK, USA, Middle East, Thailand, Singapore, Hong Kong, Holland, Japan and Australia. AMRUTANJAN: Amrutanjan was launched as a pain-relief balm in 1893 in Mumbai, by freedom fighter Dessodharaka Kasinadhuni Pantulu. “It was formulated using Ayurveda, as a native alternative to western medicinal pain-relief products which were being forced upon Indian consumer during colonial times,” says S. Sambhu Prasad, chairman and MD, Amrutanjan Healthcare Ltd. “And to this day, the founding values of consumer satisfaction, holistic healing and pain relief without side effects are the pillars that this iconic brand stands on,” he says. One can safely say that Amrutanjan is one of the oldest pain-relieving balms in the world that is still controlled by its founding family. In addition to conventional advertising, the company uses social media campaigns. “Our marketing strategy is built on this promise, “kick out pain”, which gives consumers the freedom to manage their health and deal with pain once and for all,” Prasad adds. “While we have modernised the delivery system using sprays and gels, we have not deviated from the principles as far as product formulations go.” For a 124-year-old brand, the multi-generational recommendation is what drives core business. “Consumer recommendation is critical and has been a metric which we as marketers ensure we grow and don’t take for granted,” says Prasad. Several new brands have entered the market so how does Amrutanjan hold its own? “Offering it at price points helped. Amrutanjan pioneered the ‘two rupee’ balm in India by offering it in sachets for the first time. The strategy was to make the balm available in different models to revive the business —like body spray, gels, and creams. “And as long as we focus on the customer and business fundamentals we are confident of a bright future. We have modernised consumer experience while keeping the core intact,” Prasad says.